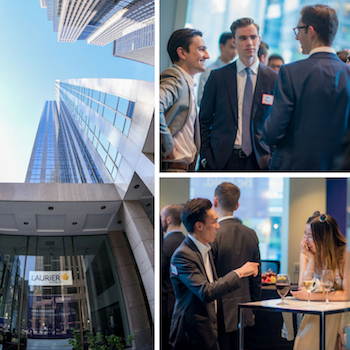 On the evening of May 29, more than 120 current, former and future Lazaridis School students came together in Toronto for the 1st Laurier Finance Meet-Up. The event was co-hosted by the Lazaridis Master of Finance program, the Laurier Graduate Student Investment Fund and the Laurier Student Investment Fund. Designed to be a casual social event, the meet-up focused on bringing together current and future leaders within the Toronto finance industry with the aim of creating new connections, re-establishing old ones and sharing ideas about the future of the financial services sector. Masters of Finance Program Director, Tony Tang says the first meet-up was a success and that the network of alumni, industry partners and the Lazaridis School will continue to grow with events like these. Among the assembled guests, the stars of the event were those alumni who have made significant impacts on the Canadian business landscape, including Greg Dean (BBA ’08), Principal and Portfolio Manager, CI Investments Inc., Cambridge Global Asset Management, John McKenzie (BBA ’95), CFO, TMX Group Ltd and Joe Overdevest (BBA ’02), Director of Research and Portfolio Manager at Fidelity Investments who thinks very highly of the chance to meet up with fellow Golden Hawks. Pictures of the event have been added to the public Lazaridis School Facebook page.